This Lease Agreement (hereinafter referred to as the “Lease”), and is entered into as of this ____ day of May, 20__, between _____________, (hereinafter referred to as the “Landlord”), and ________________ (hereinafter referred to as the “Tenant”). A. Landlord is the owner in fee simple of a parking lot located at the southeast corner of the intersection of Sixth Avenue and Bell Street in the City and County of _____________. 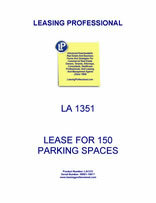 B. Tenant desires to lease from Landlord one hundred fifty (150) motor vehicle parking spaces located on the west side of Landlord’s parking lot, for use by Tenant’s employees, for an initial term of one year and for such additional periods as the parties may agree. C. The purpose of this Lease Agreement is to set forth the agreement of the parties with respect to the lease of such parking spaces by Landlord to Tenant. 1. Leased Area. In consideration of the payment of rent herein provided and the performance of each of the covenants of Tenant herein set forth, Landlord hereby leases to Tenant one-hundred fifty (150) motor vehicle parking spaces located on the west side of the parking lot at the southeast corner of the intersection of Sixth Avenue and Bell Street, in the City and County of ________________, as identified in Exhibit A to this Lease (hereinafter referred to as the “Leased Area”). 2. Term. The Lease will commence on May 15, 20__ and will terminate at midnight on May 14, 20__, unless extended in accordance with the provisions of paragraph 10 hereof. 3. Rent. Tenant agrees to pay an annual rent of ________________________ ($________), payable in equal monthly installments of ________________ ($_____________) each on the first day of each calendar month, except that rent for the month of May 20__ is paid herewith. Rent shall be paid in the form of Tenant's corporate check, payable to Landlord without deduction or offset, and shall be delivered to Landlord at the address set forth in paragraph 20 below. d. The Leased Area is in good condition and free from any surface or other defect that might impair its use for the purposes of this Lease. b. It is not a party to any agreement or understanding the terms of which are inconsistent with this Lease.